There was a theme that connected much of a recent trip to Québec City: fabric pots. They were in front of the parliament building, on a rooftop garden, in public gardens. The pots ranged in size from small to large; some held a single plant, like a tomato, others had various herb combinations. But the most remarkable use of these fabric pots was found in a couple of gardens that created these fabulous willow arches—almost like a living pergola. The one shown here at the top of the article was at the Maison de Lauberivière, part of the rooftop garden that sits atop Québec City’s largest homeless shelter. I’ve seen fabric pots at various garden centres and in the Lee Valley catalogue. Many of the fabric pots throughout Québec City are made by a company called Smart Pot. I was given one to try out by Les Urbainculteurs, an urban gardening collective that is responsible for the rooftop garden and a Smart Pot distributor. Apparently fabric pots offer an advantage over plastic in that they allow air to pass through the sides, which serves to air-prune and enhance a plant’s root structure. Some have handles, so you can move them around if you have to. 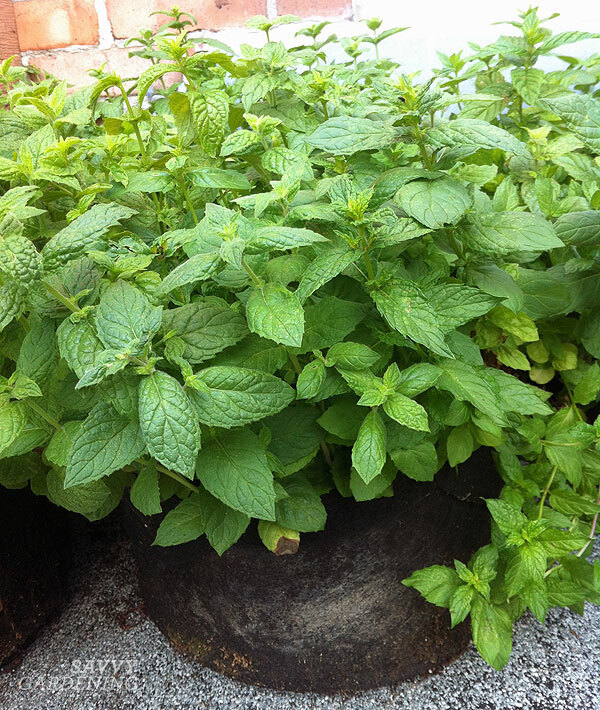 I’ve grown potatoes in mine, but another great use for a fabric pot would be to contain spreaders, like mint. Fabric pots are also great for container spreaders, like mint! In researching my book, Raised Bed Revolution, I discovered another company called Woolly Pocket that makes fabric raised beds, as well as fabric pockets that you can plant in. The example below is referred to as a Lil’ Meadow with Reservoir. Have you gardened in fabric pots or raised beds?